There is no need to be really worried. Just don't update to WP 5.0. You will still get security updates anyway. And then you can see how everything plays out. I already disabled the auto-updater on my host! I won't update to 5.0 because I don't like the idea of upgrading to gutenberg... and using a plugin to disable it! But that won't be a long term solution, I really fear we'll be left behind and sooner or later we'll have to switch to 5.0, or change CMS by good. Well, of course, I can't predict the future. And I agree that not updating to WP 5.0 isn't going to be a solution for the long term. But I am not at all convinced that Gutenberg is going to be around for the long term either. 2. Alternative editors for WP get developed as plugins. 3. Core develops a new editor itself (GB II?) to replace GB. My preference would be (1) if that means that the new project would be free from the control of self-serving devs who don't listen to what users want. But (2) would work for me too, and so might (3). @ryanb I've been using S2Members for years & happy-ish with it but as my paying subscriber base has steadily grown, I feel that it could prove to be catastrophic to my business if S2Member, or some function of it (with Stripe or WordPress) stops functioning due to the constantly evolving technology. I can no longer risk waiting for the S2Member team to decide if & how they are going to continue to support it & as they made the mistake of using one-time pricing vs. a recurring annual charge, I really don't see how the can afford to continue to both support & improve this plugin indefinitely, especially as new sales will likely taper off going forward. It appears to me that only 1 of the 8 (username OR email) is an option under the S2member export (and advance export) function. I have a ticket into Stripe to see if they can provide that info for me but wondered if you were able to export that data from S2Member somehow? Any help would be greatly appreciated. Thx. My site at the time had less than 100 active members, before I made the system change, I disabled any recurring memberships via stripe. Then I just did a simple manual adjustment by creating new transactions in Memberpress and offering new recurring plan that members just re signed up for using stripe checkout. So I didn’t import S2Member data, warned my members that I was experimenting and made deals if they went for the ride. I went on a membership system buying spree, still think Memberpress is top choice for members access system, used RCP Pro last couple months but it’s an addon and bug fest. Right now I’m using WooCommerce due to a pay per post plugin I really love, then memberships/subscriptions, and full store system. Can’t beat a cart system when selling individual posts, and future physical goods too, profits higher. Thx Ryan, good stuff. I was considering offering the ability to purchase individual posts. I think I'll go ahead & give it a try based on your experience with it. Much appreciated. The Pay Per Post setup is very interesting and you wouldn't even need a membership system if you didn't need anything else, ive got one setup so I can make sort of a buying club giving members more exclusive posts and discounts built in. With just woocommerce installed, woocommerce pay per post plugin made by third party which locks down posts on its own, and official woocommerce order status control extension (this automates the completed order status for virtual and downloadable orders so you don't need to manually process each order) you got a nice little system. Can do just post/pages or bundle of posts/pages using products, all of woocommerce payment setups, nice touch is apple pay using stripe is killer. The premium version of the pay per post plugin gives post limit restrictions views/time/delay, some shortcodes for listing purchased products and worth every penny which is a subscription setup or flat payment. Only thing is for each paid post you'll need to also pre make a product too unless you bundle posts. Hey Ryan, would you care to elaborate on this? I'm looking at options for a new site and s2Member is not filling me with confidence so I've been exploring other options. At present, RCP seems like the best bet. Others are MemberPress and MemberMouse but to me, RCP looks more appealing. I especially like their 'group' memberships with one managing account and several seats within their group. It would work well for us, so I'm wondering what are the bugs you experienced and what's your overall take on it? Apologies to OP if this is too off-topic! With RCP Pro I bought the lifetime after testing awhile and this was the main reason to save money or so I thought, problem is you will need a bunch of plugins to get functions many other systems have built in. Things like last login, WP dashboard lockout for members, custom login forms, these were some basic stuff I had to install addons for. Additional RCP plugins might have yearly subscriptions for just basic functions, this over time got on my nerves and many are 3rd party vendors with some shady sites. The recurring subscriptions would not always setup when a customer would buy on my installation was main issue, if the setting was on for recurring it didn’t setup in stripe often. You have to install a third party plugin to make a minor setting to enable a group of subscriptions to be recurring only this little setting is $15 a year, you can set it to off/on in by default in RCP settings but it’s a sitewide setting which infuriated me without the additional plugin. I wanted some recurring only then some buy now type setups. I started realizing over time how basic the top of the line RCP PRO was. Most other bugs were from the 3rd party plugins I installed that are shown on the rcp site as addons, just sloppy halfway working stuff. Form builder was one just had formatting error on the GUI and creator still hasn’t updated. RCP PRO just felt sloppy to me overall, MemberPress was leagues better and very polished accept for the addon updates which is a tad sloppy. You would see that a plugin had an update but MemberPress addons are not shown as plugins and so you would go to addon page and have to deactivate, remove reinstall when you found and addon has an update. It wasn’t very noticeable on what addon has an update either as it just shown in bold letters in a sea of text, have to look carefully. MemberPress Plus/Pro has a umbrella/group account addon built in too with a nice dashboard for the main account owner. I went to Woocommerce setup now and won’t look back even if it’s a bit more expensive per site and with extension subs. I still use the RCP Pro on other sites where just basic functions are needed. MemberPress has a very active team updating their system, in account dashboard you can see new beta versions just about every week when logged onto MemberPress site. This whole thing of seeing active development has made me more proactive on my sites of always showing the members that I am always updating and adding new content, it does make a huge impact. Tried it already, didn’t like although they’ve had new updates since. I went to Woocommerce setup now and won’t look back even if it’s a bit more expensive per site and with extension subs. Are you saying you replaced MemberPress with Woocommerce? Nevermind, I see you mentioned in a previous comment that you did switch to Woocommerce with an add-on plugin. I did, I really liked the ability to offer built in discount to all products aka pay per post via a membership or multiple memberships. I have not used it very long, so far it’s looking good. Memberpress does integrate with WooCommerce via an addon in plus/Pro versions and can be sold as a product too enabling all payments options in woo, but no discount built in for members aka buying club. It’s a tough call I lost a few built in features of Memberpress to get this discount function with memberships for products that is well pronounced in all products I set it for or all. which membership plugin for woocommerce did you end up with (or which combination)? I also think moving to WooCommerce plus plugins for handling memberships is the best solution. Just need to somehow import a couple of thousand existing subscriptions (and yes - manual or even worse asking people to resubscribe is no option, needs to be easily scriptable at least). these are the latest features https://www.armemberplugin.com/ for armember. I am using the Woocommerce bundle option of Memberships + Subscriptions, I only use a membership to set product discounts and I have an Woocommerce extension for smart coupons to setup a neat store credit system that is auto setup when they purchase a membership. I will be using the memberships more later for some special content setup that will be typical restricted category etc. My site is focused on a Pay Per Post setup using a 3rd party plugin. 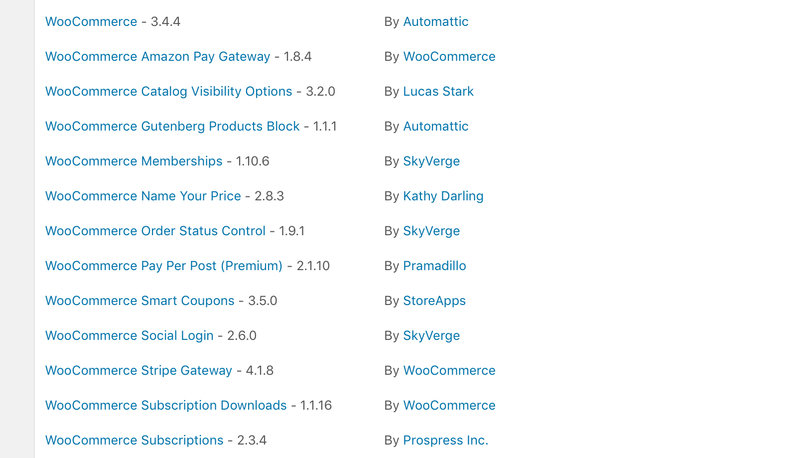 All my current Woocommerce plugins and extensions. All the official stuff which is pricey around $525 usd per year and the one pay per post plugin which is $10 per month. thanks ryanb - I willl check out to either move to Woo and ditch s2member fully, or maybe move to Optimizemember (fork of s2member) with ThriveCart. Did anyone switch over to Memberpress? Switching to OPM is pretty easily possible (see it's own thread for it) -but ThriveCart is not properly supported except by using Zapier or Infusionsoft as intermediate step. Memberpress really seems well worked out if the feature set is enough. As memberpress also supports ccaps I guess if you still need s2member for protection or whatever - you could just sell that via memberpress - and then use s2member conditionals to manage those missing features. S2member is really good at protecting content - but it really lacks or is buggy in everything else IMHO. Memberpress with ThriveCart (or a WooCommerce setup with ThriveCart) and then s2member for nothing but it's content protection could be a killer of a setup. But selling anything through s2member or depending on s2member to manage/demote users is just a nightmare (also no plugin adds a fully working email solution to s2member). Invoices could go through ThriveCart if you don't need all the bells and whistles - or through Quaderno.io if you need (Quaderno really integrates perfectly with Woo or Memberpress or Thrivecart) and quaderno.io is super polished. And well - even though I'm not a big fan of Gutenberg or any page builder - it really seems like it will be the defacto standard going forward. Without Gutenberg we would have a crazy situation of each pagebuilder doing things differently - and compatibility of wordpress going crazy. Gutenberg looks to set standards so that even if people continue using Divi, Beaver, Thrive Themes, Elementor and Co. - due to Gutenberg there will be a standardization in all of this which helps everyone in the long run. Any news here? It has been often said that s2member is active developed and an update will come soon. When will that be? Somebody know more? Short feedback from the development team would be great.